The music scene in Toronto has evolved significantly over the past two decades. One of the constants over that time however, has been the gruff folk songwriter Hayden. 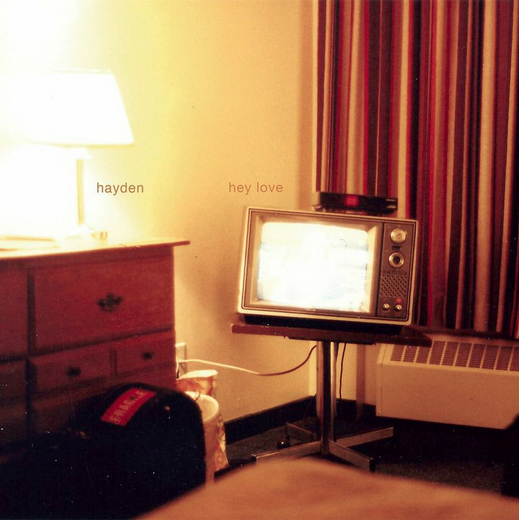 On March 24th Hayden returns with an album of new studio material, Hey Love. Anyone familiar with Hayden will know what to expect from the album: brooding, glacially-paced songs. And for the most part that's what we get. Tracks like "Five Seasons", "Shelter", and "Orange Curtain Light" are typical Hayden right down to the morose falsetto. The glacial tempo of the opener "Hearts Just Beat" takes a slightly different slant, with a National-style slow building complex arrangement. Hayden's songs are most engaging when he pays more attention to melody. That makes the still-sorrowful "Troubled Times" a standout. It works equally well with the easy hooks of "If More Things Go Wrong" and the title track. "Nothing Easy Feels This Good" throws a curve at us, as it's what I'll describe as a synth-strumental. A fuzzy raw guitar adds a visceral element to "Just Come Out Tonight". Hey Love is a record that won't make anyone rethink their stance on Hayden's music. It's simply another album that his staunchly loyal fans will most certainly lap up. Hayden plays the Field Trip Festival in Toronto on June 7th. Best tracks: "Troubled Times", "Hey Love"